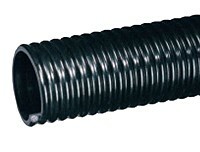 Kuriyama - CF Cold Flex Heavy Duty Low-temperature PVC General Purpose Suction and Transfer Hose - 2 in. X 100 ft. - OD: 2.41 in. • Low temperature suction applications. • Black HMW PVC convoluted construction - provides great flexibility in sub-zero temperatures. • Smooth bore construction - allows unrestricted material flow. • All sizes full vacuum rated at 68°F.